I have been an avid watercooler for quite a while, something like 10 years or so...So when a claim comes out saying that a 280mm radiator can dissipate 500 watts, well I want to know how. I have seen thick radiators that can’t dissipate half that amount, so what does Enermax have in terms of special sauce? Hey what’s up OCNers! Bluedevil here. AIOs are pretty much the golden standard when it comes to high end CPU coolers. Those whom would want more, will go for more exotic cooling, or go custom water and I just happen to have a Swiftech H240X2 Prestige, which is part custom water, part AIO. 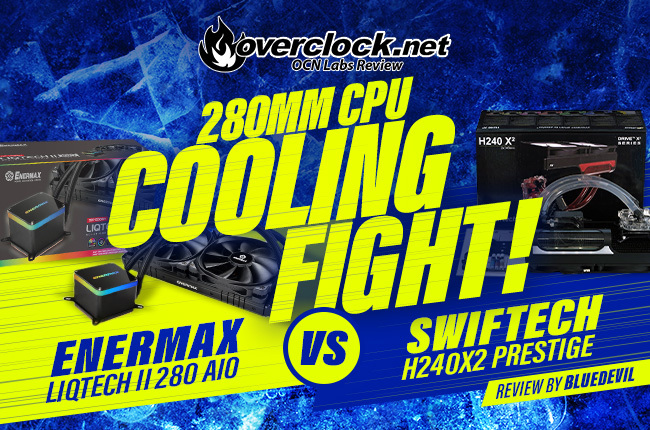 So my question is, can the Enermax Liqtech 2 280mm beat the Swiftech H240X2 Prestige? Now the Enermax Liqtech 2 series is being marketed as high efficiency performance, namely claiming to be able to support 500w+ TDP. Having a patented Shunt Channel Technology, which boosts thermal conductivity and increases the heat exchange rate by 30%. The integrated EF1 pump, which boosts it’s 7 times more powerful than other traditional AIO pumps. Taking both the EF1 and the Shunt Channel Technology, this might be Enermax’s secret in able to cool such a high TDP. Now what would be an AIO be today without aRGB? Well surprisingly enough, there is only one element of aRGB, on the EF1 pump/block. It’s subtle, yet tasteful at the same time. Controlling it is easy from your 5v 3 pin header on your motherboard or by using the included wired controller. Which enables you to control up to ten preferred lighting effects with colors, brightness, and speed. Personally, the included controller, is great for people that haven’t yet upgraded to a motherboard that has a 5v 3 pin header. The new 140mm fans might also add to the secret sauce that Enermax has been brewing up as well. The innovative high pressure fan blades are more of a swept blade design rather than traditional fan blades, rated to provide 32 to 81 cfm of static pressure through the aluminum 280mm radiator. Speaking of radiator, the FPI, or Fins Per Inch, also might be another ingredient on why the 500W TDP is present. Having a high FPI increases surface area, effectively allowing for more cooling headroom, which the Liqtech 2 280mm has a very tight fin stack. My bench system is a Intel 8700K overclocked to 5ghz, on an Asus Z370 Maximus X Code motherboard, 16GB of DDR4-3000 from Team Group, and a Zotac GTX 1070 Ti Amp Extreme. Also being an AIO test, this was performed on an open air test bench, the Streacom BC1. Installation was pretty standard, so if you have installed an AIO liquid cooler before, the Liqtech 2 280mm is no different. Alright, in the world of AIO coolers, the Liqtech 2 280mm offers some of the best cooling available. 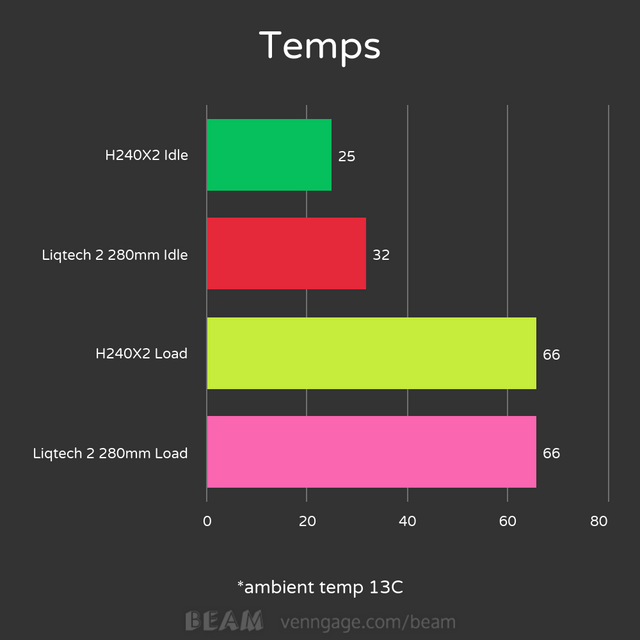 Just looking at my test results, I would say that if anyone wants near custom WC, with pretty much the same temps and noise, well the Liqtech 2 280 might be your next AIO. At $150, the Liqtech 2 280mm starting to skirt the pricing of some custom kits, that offer much more expandability. Even at sub $150, the Corsair H115i is quite popular, and should offer comparable performance. Pricing aside, the Liqtech 2 280mm AIO is really nice. The finishes like the heatsinks on the side of the radiator, the rubber dampeners on both sides of the fan mounts, everything just feels polished. 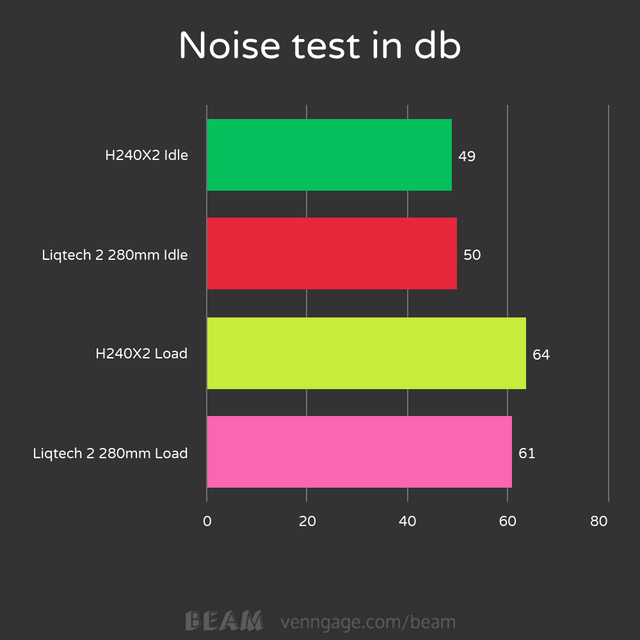 This brings me back to my original question, can and does the Liqtech 2 280mm dissipate 500 watts? I wouldn’t think a 280 aluminum radiator can. Downsides are pricing with a dash of an overzealous dissipation claim. With that 4 out of 5 flames. Ok guys, it’s been real, it’s been fun, it’s been real fun. If you haven’t liked and subscribed by now, you know what to do! Last edited by ENTERPRISE; 04-09-2019 at 09:38 AM. I own a Enermax product (LEPA LC-240) and the cooler I had already posted why not to, or caution on buying. First they are out marketing like all these days Boosting the product, but out of the box both time the one of the two cooling fans rattle horrendously and it is something they should check before packing or shipping for that matter. I don't enjoy expecting the product to be solid and it is faulty out of box. The second thing is yes the unit lasted one month before the warranty was up. We relocated and after plugging up I was having issues with shutting down for no reason. Turns out the coolant had all but evaporated. After removing the unit shaking the radiator you could here very little coolant within. After a rather hassle of a time trying to return they finally sent me a replacement unit, as I stated above out of box new wrapping defective fan. Don't get me wrong I do like the fan blade design but a bit more Q&A could prove better to the consumers. As with any choice of AIO or Liquid Cooling do keep a factory or aftermarket CPU cooler on hand with extra Thermal Paste of choice. Always have a backup. I not saying the units here are bad, I stating buyer beware as I found the elbows hoses from the block push pretty hard against my memory stick that places a lot of pressure on the mounting area. Again very thick hose as concept that it can maintain less chance of evaporation. The product can work fine but Q&A should be a bit better, Some of these issue do not show till weeks or months of usage. Enermax Support is rather shoddy to with all the requirement to take photos and removing this and that, only to get a refurbished unit with x2 new fans mounts and all. Nice work! The video quality, editing, and B-roll footage was high quality. Some friendly criticism... Here you have a powerful AIO which apparently deigned to handle modern high-wattage HEDT CPU's, but you didn't evaluate it's lofty claims. The company touts the 500+ watt TDP as if it was hard earned, and looking at their website it's clear they quite proud of it. In my opinion you didn't do the product justice by testing with an 8700k, which has a stock TDP of 95w. Even overclocked to 5G as you have done, you wont be anywhere near where you need to be to adequately test the claims of this AIO. I suppose that would be like trying to do a review for the new XMP-4800 DDR4 memory modules on a midrange 4-dimm gaming motherboard. Thank you for your appreciation to how hard the video work is. Like I said on YT, I don't have a HEDT chip atm. I test with what I got. And no I am not sending it to you. They cooled fx 9590 with h100i back in the days..
Watercooler are just overated the 5 years old 280mm perform the same as a new one almost. I wonder who build this one ? Is it asetek ?